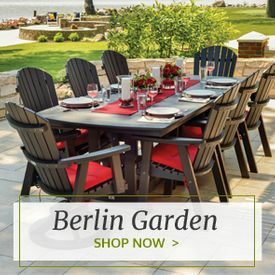 Berlin Gardens ***Save up to 45%***Free Shipping***No Taxes. 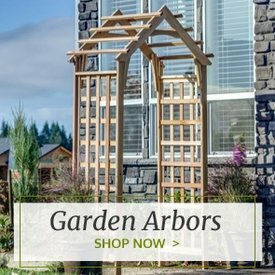 Berlin Gardens is a respected outdoor furniture company that uses traditional Amish craftsmanship techniques to create all of its high quality, detail-oriented furniture pieces. 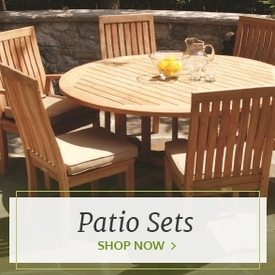 Items like club chairs, chaise lounges and outdoor dining sets are made of the finest polyresin materials for an attractive appearance and maximum durability against the outdoor elements. Each board on Berlin Gardens' furniture is cut with a machine for exact accuracy, and then the pieces are hand routed and partially assembled for the customer's convenience. 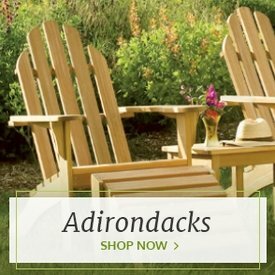 Outdoor Furniture Plus is one of the most reliable online distributers of Berlin Garden chairs and furniture, so you can be assured that each beautifully crafted piece is authentic and just as attractive as it appears in the photo. 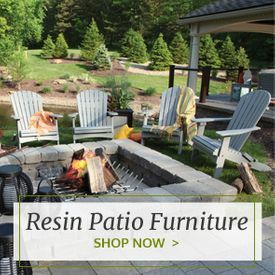 Shop our entire selection of Berlin Gardens Resin furniture and receive a 20-year warranty for homeowners and a 5-year warranty for commercial use. Already a Berlin Gardens owner. Learn how you can potentially received a $500 credit to use for more Berlin Gardens products. See the details here: Contest Details & Official Rules - Click Here.